"Neuroglia" redirects here. It is not to be confused with Neuralgia. For the scientific journal, see Glia (journal). Illustration of the four different types of glial cells found in the central nervous system: ependymal cells (light pink), astrocytes (green), microglial cells (dark red), and oligodendrocytes (light blue). Glia, also called glial cells or neuroglia, are non-neuronal cells in the central nervous system (brain and spinal cord) and the peripheral nervous system. They maintain homeostasis, form myelin, and provide support and protection for neurons. 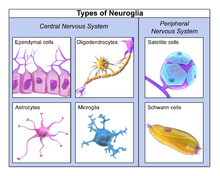 In the central nervous system, glial cells include oligodendrocytes, astrocytes, ependymal cells, and microglia, and in the peripheral nervous system glial cells include Schwann cells and satellite cells. They have four main functions: (1) to surround neurons and hold them in place; (2) to supply nutrients and oxygen to neurons; (3) to insulate one neuron from another; (4) to destroy pathogens and remove dead neurons. They also play a role in neurotransmission and synaptic connections, and in physiological processes like breathing. While glia were thought to outnumber neurons by a ratio of 10:1, a recent study provides evidence for a ratio of less than 1:1. Glia were discovered in 1856, by the pathologist Rudolf Virchow in his search for a "connective tissue" in the brain. The term derives from Greek γλία and γλοία "glue"(/ˈɡliːə/ or /ˈɡlaɪə/), and suggests the original impression that they were the glue of the nervous system. The most abundant type of macroglial cell in the CNS, astrocytes (also called astroglia) have numerous projections that link neurons to their blood supply while forming the blood-brain barrier. They regulate the external chemical environment of neurons by removing excess potassium ions, and recycling neurotransmitters released during synaptic transmission. Astrocytes may regulate vasoconstriction and vasodilation by producing substances such as arachidonic acid, whose metabolites are vasoactive. Astrocytes signal each other using ATP. The gap junctions (also known as electrical synapses) between astrocytes allow the messenger molecule IP3 to diffuse from one astrocyte to another. IP3 activates calcium channels on cellular organelles, releasing calcium into the cytoplasm. This calcium may stimulate the production of more IP3 and cause release of ATP through channels in the membrane made of pannexins. The net effect is a calcium wave that propagates from cell to cell. Extracellular release of ATP, and consequent activation of purinergic receptors on other astrocytes, may also mediate calcium waves in some cases. In general, there are two types of astrocytes, protoplasmic and fibrous, similar in function but distinct in morphology and distribution. Protoplasmic astrocytes have short, thick, highly branched processes and are typically found in gray matter. 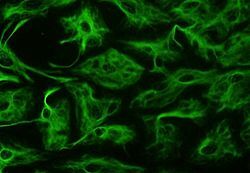 Fibrous astrocytes have long, thin, less branched processes and are more commonly found in white matter. It has recently been shown that astrocyte activity is linked to blood flow in the brain, and that this is what is actually being measured in fMRI. They also have been involved in neuronal circuits playing an inhibitory role after sensing changes in extracellular calcium. Oligodendrocytes are cells that coat axons in the central nervous system (CNS) with their cell membrane, forming a specialized membrane differentiation called myelin, producing the myelin sheath. The myelin sheath provides insulation to the axon that allows electrical signals to propagate more efficiently. Ependymal cells, also named ependymocytes, line the spinal cord and the ventricular system of the brain. These cells are involved in the creation and secretion of cerebrospinal fluid (CSF) and beat their cilia to help circulate the CSF and make up the blood-CSF barrier. They are also thought to act as neural stem cells. Radial glia cells arise from neuroepithelial cells after the onset of neurogenesis. Their differentiation abilities are more restricted than those of neuroepithelial cells. In the developing nervous system, radial glia function both as neuronal progenitors and as a scaffold upon which newborn neurons migrate. In the mature brain, the cerebellum and retina retain characteristic radial glial cells. In the cerebellum, these are Bergmann glia, which regulate synaptic plasticity. In the retina, the radial Müller cell is the glial cell that spans the thickness of the retina and, in addition to astroglial cells, participates in a bidirectional communication with neurons. Similar in function to oligodendrocytes, Schwann cells provide myelination to axons in the peripheral nervous system (PNS). They also have phagocytotic activity and clear cellular debris that allows for regrowth of PNS neurons. Satellite glial cells are small cells that surround neurons in sensory, sympathetic, and parasympathetic ganglia. These cells help regulate the external chemical environment. Like astrocytes, they are interconnected by gap junctions and respond to ATP by elevating intracellular concentration of calcium ions. They are highly sensitive to injury and inflammation, and appear to contribute to pathological states, such as chronic pain. Are found in the intrinsic ganglia of the digestive system. They are thought to have many roles in the enteric system, some related to homeostasis and muscular digestive processes. Microglia are specialized macrophages capable of phagocytosis that protect neurons of the central nervous system. They are derived from the earliest wave of mononuclear cells that originate in yolk sac blood islands early in development, and colonize the brain shortly after the neural precursors begin to differentiate. These cells are found in all regions of the brain and spinal cord. Microglial cells are small relative to macroglial cells, with changing shapes and oblong nuclei. They are mobile within the brain and multiply when the brain is damaged. In the healthy central nervous system, microglia processes constantly sample all aspects of their environment (neurons, macroglia and blood vessels). In a healthy brain, microglia direct the immune response to brain damage and play an important role in the inflammation that accompanies the damage. Many diseases and disorders are associated with deficient microglia, such as Alzheimer's disease, Parkinson's disease, and ALS. 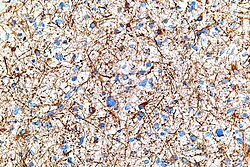 Pituicytes from the posterior pituitary are glial cells with characteristics in common to astrocytes. Tanycytes in the median eminence of the hypothalamus are a type of ependymal cell that descend from radial glia and line the base of the third ventricle. In general, neuroglial cells are smaller than neurons. There are approximately 85 billion glia cells in the human brain, about the same number as neurons. Glial cells make up about half the total volume of the brain and spinal cord. The glia to neuron-ratio varies from one part of the brain to another. The glia to neuron-ratio in the cerebral cortex is 3.72 (60.84 billion glia (72%); 16.34 billion neurons), while that of the cerebellum is only 0.23 (16.04 billion glia; 69.03 billion neurons). The ratio in the cerebral cortex gray matter is 1.48, with 3.76 for the gray and white matter combined. The ratio of the basal ganglia, diencephalon and brainstem combined is 11.35. The total number of glia cells in the human brain is distributed into the different types with oligodendrocytes being the most frequent (45–75%), followed by astrocytes (19–40%) and microglia (about 10% or less). Most glia are derived from ectodermal tissue of the developing embryo, in particular the neural tube and crest. The exception is microglia, which are derived from hemopoietic stem cells. In the adult, microglia are largely a self-renewing population and are distinct from macrophages and monocytes, which infiltrate an injured and diseased CNS. In the central nervous system, glia develop from the ventricular zone of the neural tube. These glia include the oligodendrocytes, ependymal cells, and astrocytes. In the peripheral nervous system, glia derive from the neural crest. 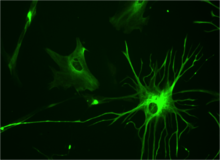 These PNS glia include Schwann cells in nerves and satellite glial cells in ganglia. Glia retain the ability to undergo cell division in adulthood, whereas most neurons cannot. The view is based on the general inability of the mature nervous system to replace neurons after an injury, such as a stroke or trauma, where very often there is a substantial proliferation of glia, or gliosis, near or at the site of damage. However, detailed studies have found no evidence that 'mature' glia, such as astrocytes or oligodendrocytes, retain mitotic capacity. Only the resident oligodendrocyte precursor cells seem to keep this ability once the nervous system matures. Glial cells are known to be capable of mitosis. By contrast, scientific understanding of whether neurons are permanently post-mitotic, or capable of mitosis, is still developing. In the past, glia had been considered[by whom?] to lack certain features of neurons. For example, glial cells were not believed to have chemical synapses or to release transmitters. They were considered to be the passive bystanders of neural transmission. However, recent studies have shown this to not be entirely true. Some glial cells function primarily as the physical support for neurons. Others provide nutrients to neurons and regulate the extracellular fluid of the brain, especially surrounding neurons and their synapses. During early embryogenesis, glial cells direct the migration of neurons and produce molecules that modify the growth of axons and dendrites. Glia are crucial in the development of the nervous system and in processes such as synaptic plasticity and synaptogenesis. Glia have a role in the regulation of repair of neurons after injury. 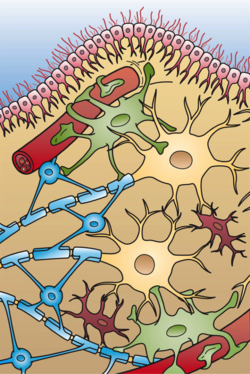 In the central nervous system (CNS), glia suppress repair. 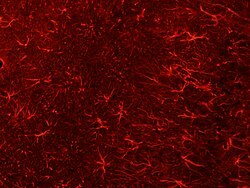 Glial cells known as astrocytes enlarge and proliferate to form a scar and produce inhibitory molecules that inhibit regrowth of a damaged or severed axon. In the peripheral nervous system (PNS), glial cells known as Schwann cells promote repair. 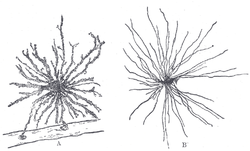 After axonal injury, Schwann cells regress to an earlier developmental state to encourage regrowth of the axon. This difference between the CNS and the PNS, raises hopes for the regeneration of nervous tissue in the CNS. For example, a spinal cord may be able to be repaired following injury or severance. Schwann cells are also known as neuri-lemmocytes. These cells envelop nerve fibers of the PNS by winding repeatedly around a nerve fiber with the nucleus inside of it. This process creates a myelin sheath, which not only aids in conductivity but also assists in the regeneration of damaged fibers. Oligodendrocytes are found in the CNS and resemble an octopus: they have bulbous cell bodies with up to fifteen arm-like processes. Each "arm" reaches out to a nerve fiber and spirals around it, creating a myelin sheath. The myelin sheath insulates the nerve fiber from the extracellular fluid and speeds up signal conduction along the nerve fiber. Astrocytes are crucial participants in the tripartite synapse. They have several crucial functions, including clearance of neurotransmitters from within the synaptic cleft, which aids in distinguishing between separate action potentials and prevents toxic build-up of certain neurotransmitters such as glutamate, which would otherwise lead to excitotoxicity. Furthermore, astrocytes release gliotransmitters such as glutamate, ATP, and D-serine in response to stimulation. While glial cells in the PNS frequently assist in regeneration of lost neural functioning, loss of neurons in the CNS does not result in a similar reaction from neuroglia. In the CNS, regrowth will only happen if the trauma was mild, and not severe. When severe trauma presents itself, the survival of the remaining neurons becomes the optimal solution. However, some studies investigating the role of glial cells in Alzheimer's Disease are beginning to contradict the usefulness of this feature, and even claim it can "exacerbate" the disease. In addition to impacting the potential repair of neurons in Alzheimer's Disease, scarring and inflammation from glial cells have been further implicated in the degeneration of neurons caused by Amyotrophic lateral sclerosis. In addition to neurodegenerative diseases, a wide range of harmful exposure, such as hypoxia, or physical trauma, can lead to the end result of physical damage to the CNS. Generally, when damage occurs to the CNS, glial cells cause Apoptosis among the surrounding cellular bodies. Then, there is a large amount of microglial activity, which results in inflammation, and finally, there is a heavy release of growth inhibiting molecules. Glia were first described in 1856 by the pathologist Rudolf Virchow in a comment to his 1846 publication on connective tissue. A more detailed description of glial cells was provided in the 1858 book 'Cellular Pathology' by the same author. When markers for different types of cells were analyzed, Albert Einstein's brain was discovered to contain significantly more glia than normal brains in the left angular gyrus, an area thought to be responsible for mathematical processing and language. Not only does the ratio of glia to neurons increase through evolution, but so does the size of the glia. Astroglial cells in human brains have a volume 27 times greater than in mouse brains. These important scientific findings may begin to shift the neuron-specific perspective into a more holistic view of the brain which encompasses the glial cells as well. For the majority of the twentieth century, scientists had disregarded glial cells as mere physical scaffolds for neurons. Recent publications have proposed that the number of glial cells in the brain is correlated with the intelligence of a species. ^ Jessen KR, Mirsky R (August 1980). "Glial cells in the enteric nervous system contain glial fibrillary acidic protein". Nature. 286 (5774): 736–7. doi:10.1038/286736a0. PMID 6997753. ^ Wolosker H, Dumin E, Balan L, Foltyn VN (July 2008). "D-amino acids in the brain: D-serine in neurotransmission and neurodegeneration". The FEBS Journal. 275 (14): 3514–26. doi:10.1111/j.1742-4658.2008.06515.x. PMID 18564180. ^ Swaminathan, Nikhil (Jan–Feb 2011). "Glia—the other brain cells". Discover. ^ Gourine AV, Kasymov V, Marina N, et al. (July 2010). "Astrocytes control breathing through pH-dependent release of ATP". Science. 329 (5991): 571–5. doi:10.1126/science.1190721. PMC 3160742. PMID 20647426. ^ Beltrán-Castillo S, Olivares MJ, Contreras RA, Zúñiga G, Llona I, von Bernhardi R, et al. (2017). "D-serine released by astrocytes in brainstem regulates breathing response to CO2 levels". Nat Commun. 8 (1): 838. doi:10.1038/s41467-017-00960-3. PMC 5635109. PMID 29018191. ^ a b c d von Bartheld, Christopher S.; Bahney, Jami; Herculano-Houzel, Suzana (2016-12-15). "The search for true numbers of neurons and glial cells in the human brain: A review of 150 years of cell counting". The Journal of Comparative Neurology. 524 (18): 3865–3895. doi:10.1002/cne.24040. ISSN 1096-9861. PMC 5063692. PMID 27187682. ^ "Classic Papers". Network Glia. Max Delbrueck Center für Molekulare Medizin (MDC) Berlin-Buch. Retrieved 14 November 2015. ^ Swaminathan N (2008). "Brain-scan mystery solved". Scientific American Mind. Oct–Nov (5): 7. doi:10.1038/scientificamericanmind1008-7b. ^ Torres A (2012). "Extracellular Ca2+ Acts as a Mediator of Communication from Neurons to Glia". Science Signaling. 5 Jan 24 (208): 208. doi:10.1126/scisignal.2002160. PMC 3548660. PMID 22275221. ^ Baumann N, Pham-Dinh D (April 2001). "Biology of oligodendrocyte and myelin in the mammalian central nervous system". Physiological Reviews. 81 (2): 871–927. doi:10.1152/physrev.2001.81.2.871. PMID 11274346. ^ Johansson CB, Momma S, Clarke DL, Risling M, Lendahl U, Frisén J (January 1999). "Identification of a neural stem cell in the adult mammalian central nervous system". Cell. 96 (1): 25–34. doi:10.1016/S0092-8674(00)80956-3. PMID 9989494. ^ Newman EA (October 2003). "New roles for astrocytes: regulation of synaptic transmission". Trends in Neurosciences. 26 (10): 536–42. doi:10.1016/S0166-2236(03)00237-6. PMID 14522146. ^ Campbell K, Götz M (May 2002). "Radial glia: multi-purpose cells for vertebrate brain development". Trends in Neurosciences. 25 (5): 235–8. doi:10.1016/s0166-2236(02)02156-2. PMID 11972958. ^ a b Jessen KR, Mirsky R (September 2005). "The origin and development of glial cells in peripheral nerves". Nature Reviews. Neuroscience. 6 (9): 671–82. doi:10.1038/nrn1746. PMID 16136171. ^ Ohara PT, Vit JP, Bhargava A, Jasmin L (December 2008). "Evidence for a role of connexin 43 in trigeminal pain using RNA interference in vivo". Journal of Neurophysiology. 100 (6): 3064–73. doi:10.1152/jn.90722.2008. PMC 2604845. PMID 18715894. ^ Bassotti G, Villanacci V, Antonelli E, Morelli A, Salerni B (July 2007). "Enteric glial cells: new players in gastrointestinal motility?". Laboratory Investigation. 87 (7): 628–32. doi:10.1038/labinvest.3700564. PMID 17483847. ^ Miyata, S; Furuya, K; Nakai, S; Bun, H; Kiyohara, T (April 1999). "Morphological plasticity and rearrangement of cytoskeletons in pituicytes cultured from adult rat neurohypophysis". Neuroscience Research. 33 (4): 299–306. doi:10.1016/s0168-0102(99)00021-8. PMID 10401983. ^ Rodríguez, EM; Blázquez, JL; Pastor, FE; Peláez, B; Peña, P; Peruzzo, B; Amat, P (2005). "Hypothalamic tanycytes: a key component of brain-endocrine interaction". International Review of Cytology. 247: 89–164. doi:10.1016/s0074-7696(05)47003-5. PMID 16344112. ^ a b c Azevedo FA, Carvalho LR, Grinberg LT, et al. (April 2009). "Equal numbers of neuronal and nonneuronal cells make the human brain an isometrically scaled-up primate brain". The Journal of Comparative Neurology. 513 (5): 532–41. doi:10.1002/cne.21974. PMID 19226510. ^ Herrup K, Yang Y (May 2007). "Cell cycle regulation in the postmitotic neuron: oxymoron or new biology?". Nature Reviews. Neuroscience. 8 (5): 368–78. doi:10.1038/nrn2124. PMID 17453017. ^ Goldman SA, Nottebohm F (April 1983). "Neuronal production, migration, and differentiation in a vocal control nucleus of the adult female canary brain". Proceedings of the National Academy of Sciences of the United States of America. 80 (8): 2390–4. doi:10.1073/pnas.80.8.2390. PMC 393826. PMID 6572982. ^ Eriksson PS, Perfilieva E, Björk-Eriksson T, et al. (November 1998). "Neurogenesis in the adult human hippocampus". Nature Medicine. 4 (11): 1313–7. doi:10.1038/3305. PMID 9809557. ^ Gould E, Reeves AJ, Fallah M, Tanapat P, Gross CG, Fuchs E (April 1999). "Hippocampal neurogenesis in adult Old World primates". Proceedings of the National Academy of Sciences of the United States of America. 96 (9): 5263–7. doi:10.1073/pnas.96.9.5263. PMC 21852. PMID 10220454. ^ Saladin, Kenneth. Anatomy and Physiology, 6th Edition. McGraw Hill 2012. Page 446-448. ^ Newman, Eric A. (2003). "New roles for astrocytes: Regulation of synaptic transmission". Trends in Neurosciences. 26 (10): 536–542. doi:10.1016/S0166-2236(03)00237-6. PMID 14522146. ^ Halassa MM, Fellin T, Haydon PG (2007). "The tripartite synapse: roles for gliotransmission in health and disease". Trends Mol Med. 13 (2): 54–63. doi:10.1016/j.molmed.2006.12.005. PMID 17207662. ^ Perea G, Navarrete M, Araque A (2009). "Tripartite synapses: astrocytes process and control synaptic information". Trends Neurosci. 32 (8): 421–31. doi:10.1016/j.tins.2009.05.001. PMID 19615761. ^ Santello M, Calì C, Bezzi P (2012). "Gliotransmission and the tripartite synapse". Adv Exp Med Biol. 970: 307–31. doi:10.1007/978-3-7091-0932-8_14. PMID 22351062. ^ Martineau M, Parpura V, Mothet JP (2014). "Cell-type specific mechanisms of D-serine uptake and release in the brain". Front Synaptic Neurosci. 6: 12. doi:10.3389/fnsyn.2014.00012. PMC 4039169. PMID 24910611. ^ a b c d Puves, Dale (2012). Neuroscience 5th Ed. Sinauer Associates. pp. 560–580. ISBN 978-0878936465. ^ Lopategui Cabezas, I.; Batista, A. Herrera; Rol, G. Pentón (2014). "Papel de la glía en la enfermedad de Alzheimer. Futuras implicaciones terapéuticas". Neurología. 29 (5): 305–309. doi:10.1016/j.nrl.2012.10.006. PMID 23246214. ^ Valori, Chiara F.; Brambilla, Liliana; Martorana, Francesca; Rossi, Daniela (2013-08-03). "The multifaceted role of glial cells in amyotrophic lateral sclerosis". Cellular and Molecular Life Sciences. 71 (2): 287–297. doi:10.1007/s00018-013-1429-7. ISSN 1420-682X. PMID 23912896. ^ Kettenmann H, Verkhratsky A (December 2008). "Neuroglia: the 150 years after". Trends in Neurosciences. 31 (12): 653–9. doi:10.1016/j.tins.2008.09.003. PMID 18945498. ^ Koob, Andrew (2009). The Root of Thought. FT Press. p. 186. ISBN 978-0-13-715171-4. ^ Aw, B.L. "5 Reasons why Glial Cells Were So Critical to Human Intelligence". Scientific Brains. Retrieved 5 January 2015. Brodal, Per (2010). "Glia". The central nervous system: structure and function. Oxford University Press. p. 19. ISBN 978-0-19-538115-3. Puves, Dale (2012). Neuroscience 5th Ed. Sinauer Associates. pp. 560–580. ISBN 978-0878936465. Barres BA (November 2008). "The mystery and magic of glia: a perspective on their roles in health and disease". Neuron. 60 (3): 430–40. doi:10.1016/j.neuron.2008.10.013. PMID 18995817. Overstreet LS (February 2005). "Quantal transmission: not just for neurons". Trends in Neurosciences. 28 (2): 59–62. doi:10.1016/j.tins.2004.11.010. PMID 15667925. Peters A (May 2004). "A fourth type of neuroglial cell in the adult central nervous system". Journal of Neurocytology. 33 (3): 345–57. doi:10.1023/B:NEUR.0000044195.64009.27. PMID 15475689. Volterra A, Steinhäuser C (August 2004). "Glial modulation of synaptic transmission in the hippocampus". Glia. 47 (3): 249–57. doi:10.1002/glia.20080. PMID 15252814. Huang YH, Bergles DE (June 2004). "Glutamate transporters bring competition to the synapse". Current Opinion in Neurobiology. 14 (3): 346–52. doi:10.1016/j.conb.2004.05.007. PMID 15194115. Wikimedia Commons has media related to Glia. "The Other Brain"—The Leonard Lopate Show (WNYC) "Neuroscientist Douglas Field, explains how glia, which make up approximately 85 percent of the cells in the brain, work. In The Other Brain: From Dementia to Schizophrenia, How New Discoveries about the Brain Are Revolutionizing Medicine and Science, he explains recent discoveries in glia research and looks at what breakthroughs in brain science and medicine are likely to come." "Network Glia" A homepage devoted to glial cells. This page was last edited on 19 April 2019, at 16:11 (UTC).